Bluenose, a 285 tons schooner, is the fantastic winner of the 1921 "International Fisherman's Trophy". This regata was held, alternate year, off Lunenberg in Nova Scotia and Gloucester in New England.Entry to the contest was strictly confined to genuine fishing vessels. Bluenose was entered for the challenge in 1921 and from then on she won every single race for which she was entered. 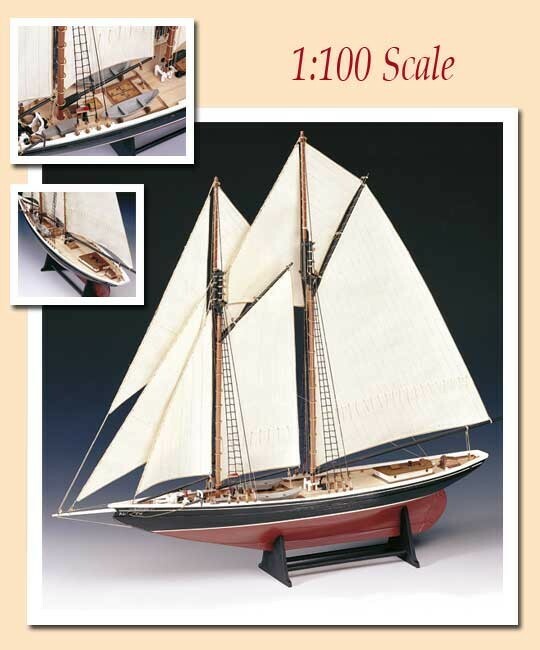 Wooden Model Ship Kit includes: pre-cut wooden parts, double planking on bulkhead construction, wooden and metal fittings, masts, spars, rope and sail cloth.